Lighting a candle has always been one of the most exciting (and easy) ways for me to freshen up my home and my mood. I’ve written a lot about my journey with anxiety, and how feeling stuck is one of the biggest contributors to it. Living in a small condo, it’s not hard to get overwhelmed with stuff – the size of my couch, where my toaster oven sits on my counter, the layout of my bedroom, the fear of not having enough space, etc. I spend so much time trying to change the space I’m in by moving things or buying things or selling things, but the serenity never lasts. What does continuously calm me, without fail, is the smell of a candle burning, the sight of a wick fluttering slowly. Growing up, my mom loved candles, too, and she’d light them after dinner sometimes when all the dishes were clean as a way to signify the end of a day filled with office and home-work. I’ve carried this symbolism with me, so when I met Jordana Schuetze, Owner of Serenity Now Candles, at Parkdale Flea in Toronto, my interest was instantly peaked. Jordana Schuetze, Owner of Serenity Now Candles. Photo courtesy of: Serenity Now Candles. When (and why!) did you start making candles? I’ve always liked creating things. I’m an obsessive candle smeller in stores but I didn’t think about making my own until I got serious about wanting my own business. I actually first thought about making my own candles from watching The Office. When I started, I became more and more excited to use design and fragrance to channel creativity. Have you always wanted to start your own business? It became more and more apparent to me throughout the last four years. It’s a process I didn’t try to rush, but started to become aware of and working towards. I’ve had a few ideas, one I was actively working on, but ultimately, felt it wasn’t quite right for me at that moment. So, I continued on in my life with an open mind. What type of environment were you surrounded by when growing up and how do you think this impacted the person, business owner and creator, that you are, today? My parents each owned their own businesses. My mom is incredibly creative, and when I was young she had a jewellery business. She used to sell at farmers markets and would bring me and my sister along. Fast forward to my first job as a teenager, I worked for friends of my family, who made pickled garlic, and sold it at farmers markets. So, I was in situations of making and selling handmade products at a young age. When I’m feeling overwhelmed or very tired, lighting a candle really calms the environment around me, ultimately relaxing me. What is the significance of a candle to you? I use candles the same way, for ambiance and relaxation. I also feel that smells have the ability to trigger memories.One significant thing for me, about candles, is that my grandma would always have a fancy candle to light at Easter dinner. When she passed, we continued to light a candle in tradition and memory of her. In February, A Quarter Young ran a campaign called #SelfLoveSymphony on Instagram and Twitter. It was all about celebrating the highs and lows of self-care and self-acceptance. What are some ways that you practice self-love and how does Serenity Now Candles help others do the same? This is something I have become more aware of over the last year. I work full time plus work on my business as much as possible. There are definitely times when I forget I need to take a moment for myself and not feel guilty about it. I think it really helps to create a nice ambiance when you’re at home to unwind from the day. I also just check in with myself and trying to gage how I’m feeling and then do something relaxing or rewarding, depending on the situation. When we met at the Parkdale Flea market, you mentioned that you make your soy wax candles at home. What’s this process like? Well, it’s hectic to say the least. It’s a two day process to pour and cool each candle. There’s usually stacks of boxes, candles in different stages, event supplies and packaging everywhere. I also have so many tester candles that didn’t make the cut stacked on my bookshelf. It’s completely taken over. When did you officially launch Serenity Now Candles? What type of initial traction did you receive? I launched August 8, 2016. There wasn’t much traction at first. But once I started doing events around the city, traction grew. By meeting potential customers in person it’s easier to create a connection. By meeting other entrepreneurs, I also gained some business buddies and we’ve created a support system for each other. Launching a business is no easy feat – what was one of the toughest lessons you’ve had to learn along the way? Learning how to sell the candles. Creating and choosing the materials and coming up with the concept were all easy for me. I know why they are awesome, but I need to work on how to convey that to people. 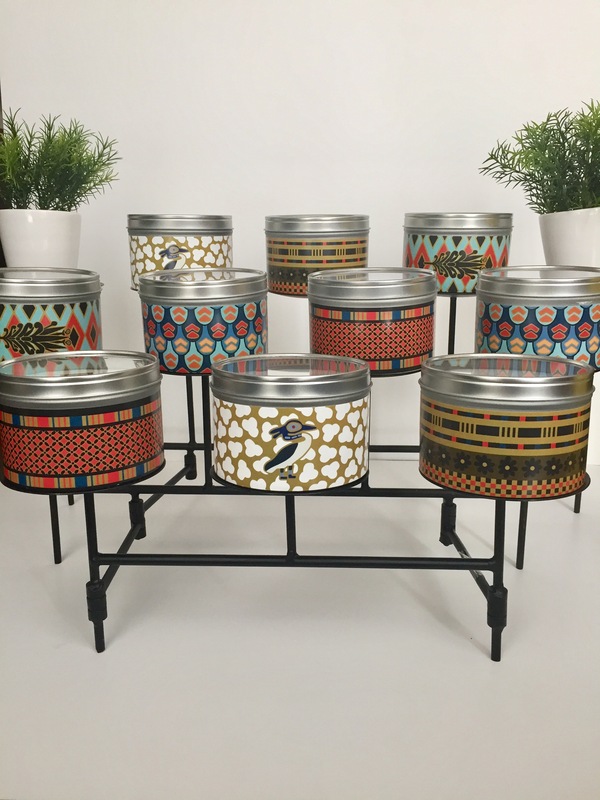 Your candles are put in beautiful containers inspired by Egypt. Why did you choose this route? I wanted to create a product that is a piece of functional artwork, that would enhance the decor of a room. My first collection is based off of Egypt because I really loved the colours and intricacies of their artwork. As I expand, there will be more collections with different themes. You make the designs for the candle containers on your own, as well. How long does it take you to make one pattern like this? Since this was my first time designing the labels, it was time consuming. I did some research to get ideas on what types of designs I wanted. I started with small sketches of things I liked, then drew each label by hand. Finally, I sent them off to my graphic designer. I’m letting ideas organically come to me for future collections, so when it’s time to fully create the designs it’s going to be a faster process to put everything together. Serenity Now Candles has amazing scents, like Lush Plumeria, Pear & Lemon Verbena, Brûléed Grapefruit, Coconut Creme and Midnight Jasmine. I love the smell of Midnight Jasmine! Which scent is your favourite and why? Ohh, this is tough. I love them all, that’s why they made the cut! I might have to go with Coconut Creme by a smidge. I’m obsessed with everything coconut, from beauty products to anything coconut flavoured. Why and how did you choose these scents? I tried to have variation, but I really stuck with fragrances I liked. I tried to create some unique fragrances, like the Brûléed Grapefruit. I get the most comments about not having smelled that combination before. I’ve had a few fragrances requested several times, which I am going to incorporate into the next collection, along with other ones I like. How many hours a week would you say you spend on Serenity Now Candles? I would say around 20 hours, it fluctuates. What has been the most effective way of spreading awareness and engaging new customers since you started on this journey? When you’re not making and selling candles, what are you up to? A lot of my time is taken up by still working a day job. Or I’m trying to find ways to relax like biking, reading and hanging out with my cat drinking wine. Work and running a business take up most of my time right now. With many projects on the go, how do you find time to recharge and refresh? Honestly, this is still a work in progress. I try to take it day by day. One thing I’m trying is to plan things in advance with my friends so I have something to look forward to and it forces me to disconnect from business and work for the day or weekend. Then I am able to come back with a fresh perspective. Who (or what) has been your biggest source of motivation when you’re in need of a creative spark? Sometimes when I really want to get work done, and I’m just not jiving, I try to focus on something different. Or go for a walk or bike ride to clear my head and let things start coming to me. If it’s for a creative idea I check out Instagram and Pinterest to get inspiration. Do you have any advice for upcoming creators, artists and entrepreneurs looking to go out on their own? Follow your gut, have patience and celebrate every success, no matter how small. For more information about Serenity Now Candles, visit their website, where Jordana outlines how she makes her products and the events she’ll be at! Find Serenity Now Candles on Etsy and Instagram, too. Thank you Jordana for sharing your journey with the A Quarter Young community!